A MERRY CHRISTMAS AND A HAPPY NEW YEAR TO EVERYONE. Christmas Eve was a busy day. Mum took J Christmas shopping to Inca (the nearest big town to us here in Sa Pobla). She had him for the whole day, which meant that C and I could pop out and do final bits and pieces as well as organising 'things' here at the house. The hens laid their eggs, well, two anyway. C & I wrapped the prezzies (not many this year), and did some cleaning and housework. We then discussed what to do with the turkey. We decided to unwrap the bird and clean it up and place it, ready, into the large oven baking tray, we had a sudden moment of doom, thinking that it wouldn't fit in the oven, but then I suggested we cut off the parsons nose and bake it separately, that way the bird would fit. 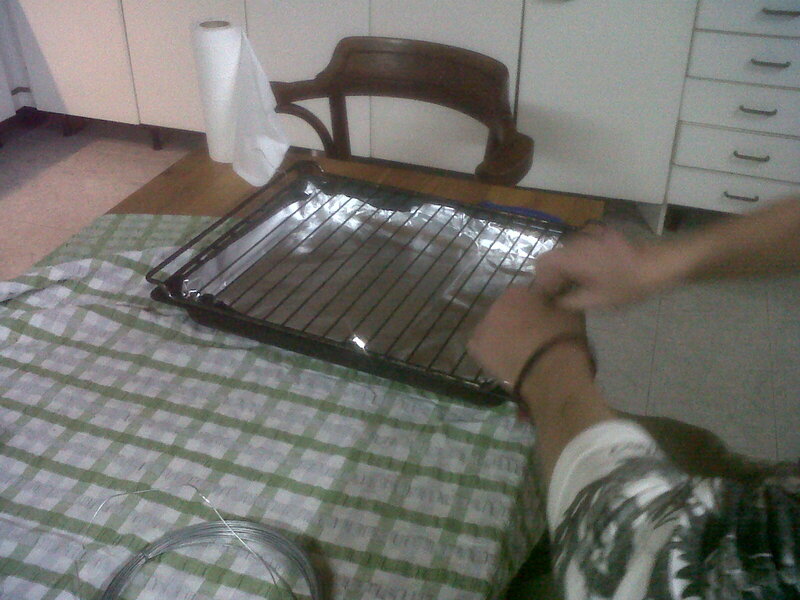 We also realised the fact that there was NO WAY it would fit if we put the bird on a rack to cook. It would be too high and touch the top of the oven. We strung the wings and legs together, I inserted butter under the skin and seasoned with salt, pepper and herbs. Then stuffed a pierced orange (straight off the tree) and lemon into the main cavity and an onion (from our local farmer) in the neck. We decided not to stuff it as it was so big. C preparing the rack we didn't use. 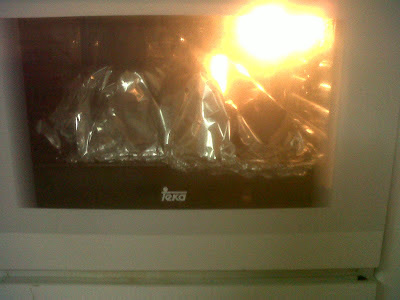 All wrapped up and covered in foil we put it temporarily into the oven. We originally thought to cook it slowly overnight, which is great if you have a very deep pan and a rack for the turkey, however, this would not have worked and actually cooking such a huge bird doesn't take a lot longer than a 20lb (9Kg) bird. So we knew we would have to get up especially early on Christmas morning to pop the oven on. Christmas Eve evening C & I went over to mum's to have a family dinner with my aunt and also to pick up J, who was exhausted from his day with Grandma. Dinner was wonderful, roast pork with lots of vegetables, followed by meringue with cream and berries and mince pies - yummmy. The pork had come from the local butcher. Meat here is so much nicer than in the UK, even the supermarket meat tastes better than the UK supermarket meat. We finished dinner, and a little mulled wine, and said our Happy Christmases and off home we went. J put his gifts under the tree and laid his stocking at the foot of his bed. He put out his note, a mince pie & a glass of milk for Santa, a carrot for Rudolf and then off to bed, complaining that he was never going to get to sleep as he was so excited. He crashed out 10 minutes later. C & I made final preparations, had the fire burning to warm the place up, carols and mugs of mulled wine. I think Santa came at about 23:00hrs because I heard a rustling sound, but when I looked in on Josh, there was his stocking filled to the brim, but no Santa! I was happy for him that Santa had visited and C & I went to bed. Setting the alarm for 4am so I could put the oven on - groan! 1AM RUFFA WAKES ME UP - HE WANTS TO GO OUT! ALARM GOES OFF - ITS 4 AM - ohhhhhhh, I am sooooooo tired. I leap out of bed and bleary eyed turn the oven to 250 c degrees, remembering to pull the turkey out first, crikey it weighed a ton at that time in the morning, I nearly did myself in! I popped the kettle on and went to put something warm on. The cold creeps up your legs through the concrete and tiled floors - it's painful! So with my red woolley Christmas socks from Norway and my turquoise crocs (lovely combo!) I went to make mugs of tea. C joined me. We were trying to be very quiet but it seems that the quieter you try to be, the more noise you end up making! we sat and talked and drank our tea, at 4.30AM I said I was putting the bird in. In it went. A feeling of panic arose as I thought, perhaps, after all our crazy efforts to raise our Christmas dinner, it would be inedible!! 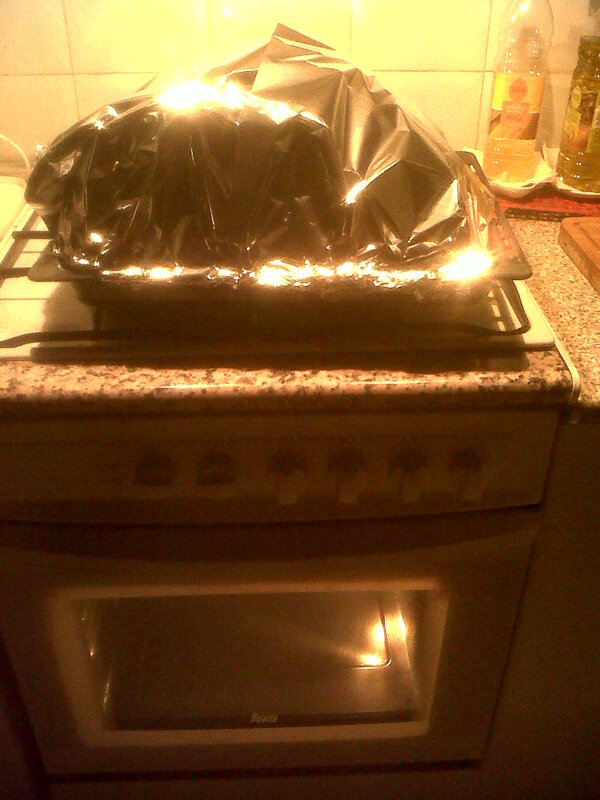 We blasted the turkey for about 40-45mins then turned the heat to about 210 degrees C and went back to bed. It was now about 5AM. I had just snuggled in when I heard 'Mummy? ', there in the gloom was a very bright eyed 9 year old. I asked him if Santa had been, he said he had, so I told him to get his stocking and bring it to our bed. This is normal for him, he always opens his stocking with us - it's quite a laugh really and fantastic to see the look on his face - a kind of sick, exhausted, excitement! We all got a few more zzzzz's. At 8am I was up and we all went about our chores. Feeding the animals, collecting eggs, preparing breakfast, skyping family abroad etc. 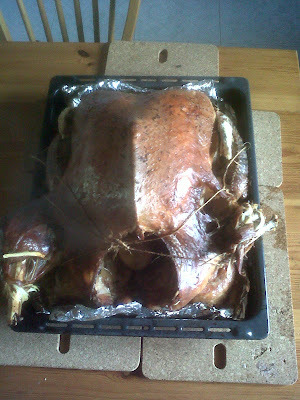 At about 9.30am we took the turkey out of the oven to see how it was doing...AMAZING, it was doing fantastically. There was so much stock in the base of the pan that I had to remove it with a turkey baster before pulling the turkey out, otherwise the kitchen floor would have been swimming in it! The bird was too big to turn over so we left it, basted and back in the oven. By 11am the bird was done - we couldn't believe it. Only 6.5 hours. We let it rest for some time and cool down a little, steam was still coming out of it an hour later. C prepared most of the vegetables and started cooking and preparing the rest of the dinner. 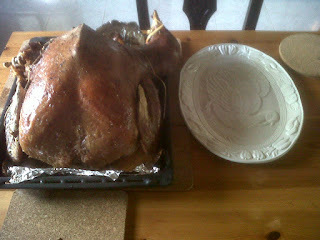 When it came to carving the turkey the meat just fell off the bone, the flavour was great. I am so happy we did it,we produced our own turkey and it was good. However, we now have enough to last us for weeks, so we are going to make pies and curries and freeze them. Done, so well, that one of the legs fell off! The turkey plate is for a normal size turkey, we had to remove the wings and legs and then it only just fitted. A happy Christmas was had by us this year and on a small budget, I am proud of ourselves for achieving this.